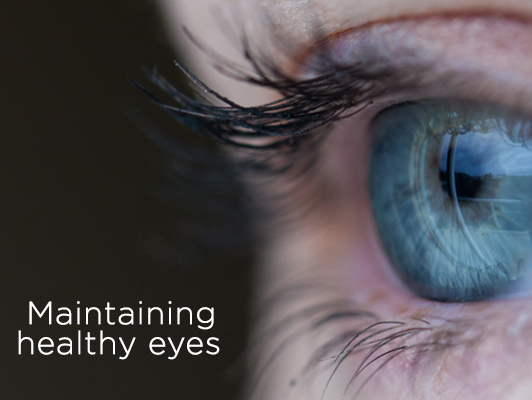 Taking good care of our eye health is vital to overall health, wellness, and well-being. While vision loss is not a normal part of aging, it’s important to protect our eyesight, even if you enjoy good eye health now. As we age it’s normal to experience some changes in vision, such as difficulty distinguishing colors, adjusting to glare, and near or farsightedness. But there are actions you can take to ensure your eyes are as healthy as possible and help prevent vision loss later in life. 1. Get a regular eye exam. Partnering with your eye doctor (an optometrist or ophthalmologist) is one of the most important actions you can take to maintain your eyesight. Depending upon your eye health and any conditions you may have, he or she can help you decide how often to have your vision examined and actions to take to protect your eyes. During regular sleep cycles, the eyes get a chance to relax and the muscles rest. Seniors who don’t get appropriate amounts of sleep can feel a decline in their quality of vision. Also, when we sleep, our eyes are lubricated and can clear out irritants that accumulate during the day. This is important in preventing infection and irritation. Research has shown that diet plays an important part in eye health. Aim for a diet rich in fruits and vegetables as well as omega-3 fatty acids found in fish. Sun exposure can be associated with developing cataracts and age-related macular degeneration, so wearing protective lenses that block both UV-A and UV-B rays is essential. Also, be sure to wear safety glasses when the eyes may be at risk for chemicals, puncture, or other harm. 5. If you smoke, quit. Smoking can increase the risk of age-related eye diseases, cataracts, and damage to the optic nerve. If you want help quitting, call your MyHealth health coach today! Weight can play a big role in eye health, because being overweight or obese can increase the risk of developing diabetes. Individuals with diabetes have risks that can lead to vision loss. Exercise is important for general health as well as eye health because it improves blood circulation, which helps improve oxygen levels to the eyes. It’s important to know if anyone in your family has or has had a disease or condition that may be inherited such as age-related macular degeneration or glaucoma. Understanding risk can help your eye doctor plan any necessary preventive measures to maintain eye health. If you use a screen such a tablet or computer often, there are precautions to to take to help prevent eye strain. Take breaks often and keep the screen 20–24 inches away from your eyes and slightly below eye level. Remember the 20-20-20 rule. Every 20 minutes look away about 20 feet in front for about 20 seconds. 10. If you wear contacts, keep them clean. If you wear contact lenses, you want to avoid the risk of infection. Easy precautions include following your eye doctor’s directions for cleaning and maintaining your lenses and always washing your hands before touching your eyes.